Ash is a beautifully light and elegant timber choice, which makes a distinguished feature in any kitchen. In particular, our ash floating shelves make for an eye-catching storage solution, boasting impressive strength and a stunning natural grain pattern than cannot be replicated. Our talented team of wood specialists have great experience working with solid timber products, and use the latest innovations in wood-cutting to ensure our ash shelves are made with maximum precision and attention-to-detail. The shelves are meticulously sanded to a 150 grit smoothness, and then finished with a protective wood oil, to enrich and enhance the natural grain of the timber. 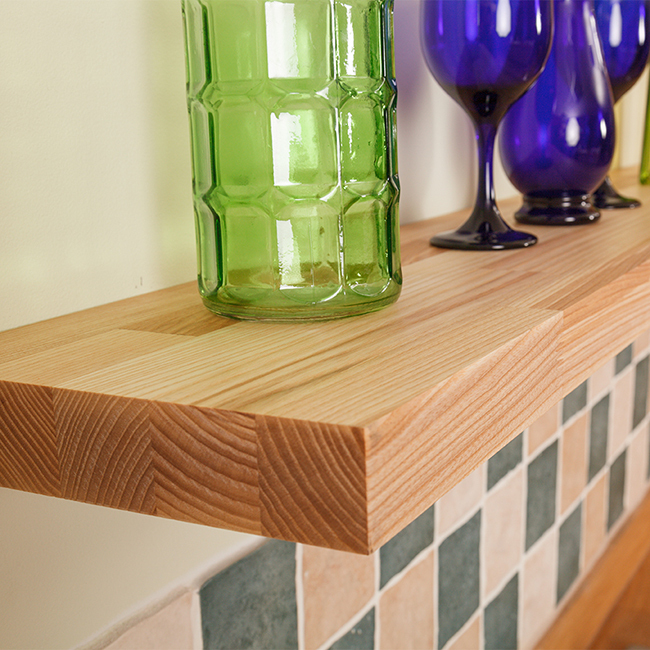 Just like our solid ash worktops, our floating ash shelves are made up of a collection of 40mm-wide wooden staves, which are finger-jointed and bonded together under high pressure to ensure ultimate resilience. Our ash shelves are also supplied with a square edge profile as standard, providing a sleek aesthetic that perfectly corresponds to the matching worktops. All of our floating solid ash shelves are provided pre-drilled and accompanied with the number of specialist brackets required to support their weight and create the impressive floating effect: two for 300mm and 600mm shelves; three for 900mm and 1200mm shelves; and four for the 1500mm-long shelving. These shelf supports are hidden once the shelving is mounted. Solid ash shelves are fairly heavy, therefore we recommend attaching the supports to a stone or brick wall. If you have a stud partition wall, the supports should be fixed into the timber studs themselves to ensure stability. As with any real wood furnishings, our ash shelving can sometimes feature small knots or splits; though these are rare, they are considered natural developments that only enhance the characterful look of the timber.